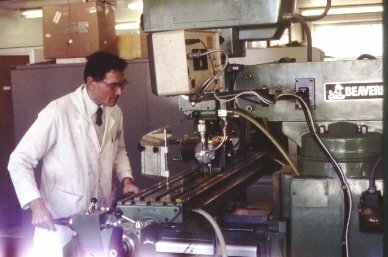 Safety aspects are prominent in engineering practice - for example electrocution hazards in electrical work, and trauma such as lacerations, amputations or worse in mechanical work. However due consideration also needs to be given to ill-health arising from other hazards. Some of these will be outlined in this page, which is still in preparation. Various forms of energy can be hazardous in engineering. These include microwaves through to light and other non-ionising or higher energy ionising electromagnetic radiation. Other harmful energies include noise which can cause noise induced hearing loss (industrial deafness), and vibration which can cause hand arm vibration syndrome. Musculoskeletal problems can also arise when inadequate efforts have been made to address ergonomic issues. 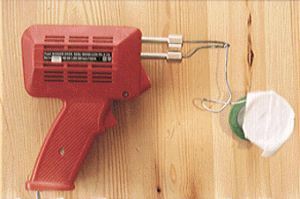 The image alongside illustrates the basic tools and materials for soldering - a suitable source of heat, and the solder. The health hazards associated with this process need to be considered. An important one relates to a component not immediately evident in the image - namely the flux (in this case colophony) which is present as core within the solder. Exposure to colophony fume can pose a significant risk of occupational asthma. Major engineering works which involve demolition could result in exposure to asbestos. Biological hazards to health are not common in engineering, but cam occur. They could range from Legionnaire's disease from the contamination of cooling towers with Legionella pneumophila, toLeptospirosis (infection with Leptospira sp.) from contamination of water.